You’re ready to make one of the biggest commitments of your life, now what? We probably can’t help write your vows or guarantee the caterer will show up on time, but we’re experts at financing the big day expenses. Visa Credit Cards - Enjoy security, low rates, rewards points, and the convenience of making purchases in-person and online from your favorite retailers. Signature Loans - A simple fixed rate loan with a consistent monthly payment, great for keeping a steady budget! Personal Lines of Credit - A revolving line of credit that's there any time you need it. You can keep this account for years to come, even if you don't use it. Search for Bargains. The caterer you hire may be willing to negotiate on the cost of children's meals and the venue you're considering may be cheaper in the Fall versus the Spring; always look for the best deals. Take on some DIY projects. Consider making your own party favors, invitations, center pieces, and more. The more you do yourself, the less you'll have to pay someone else to do. Ditch the expectations. You're not entitled to let your guests bring a plus one, your wedding rings don't have to cost 3 months salary, and you don't have to invite everyone of your extended family members. Plan your wedding with your budget in mind and don't worry about what every one is expecting. Conventional Fixed Rate Mortgage - A mortgage option with a 15-year, 20-year or 30-year fixed rate. A great option to keep your payments predictable and manageable. FHA Mortgage - Great for first time home owners because of the low down payment and maximum loan amount. VA Mortgage - Active duty and those who served in the military can qualify for this mortgage with no down payment. Get pre-approved. Before you select a licensed Real Estate Agent and explore potential homes, get pre-approved by your selected Mortgage Lender. Find an agent that's a good fit. When selecting a licensed Real Estate Agent, make sure that he/she is familiar with your desired living area and can accommodate your home buying needs. Be cooperative and prepared. Provide all necessary documentation to your Lender in a timely manner. Be patient. The mortgage process can be lengthy and challenging. Do not panic if unexpected surprises arise. Combining incomes and managing finances as a couple could mean inheriting your spouse's debts and financial burdens. There’s a first time for everything, but that doesn’t mean you have to go unprepared. Here are a few firsts Securityplus can help you with. So you’re ready to make one of the biggest commitments of your life? We’re experts at financing the big day expenses — and beyond. No matter how much you plan, things can still go wrong. During times of unexpected hardship, your credit union is still willing to help. Whether a new baby or a new pet, a growing family means growing expenses. We can help you prepare for those changes in your budget. Whether you're looking to vacation or you're relocating, Securityplus wants to make sure finances don't stand in your way. You've spent most of your life preparing to retire. We can help ensure that you are financially equipped to do so comfortably. We were named 'Corporate Citizen of the Year'! 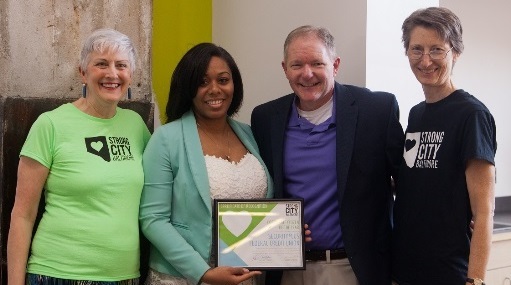 Securityplus was named 'Corporate Citizen of the Year' by Strong City Baltimore. If you live, work, worship, or go to school in the City of Baltimore; are employed by or retired from SSA or CMS; or are in the immediate family of an existing member, you are eligible to join our credit union. Founded in 1938, Securityplus is one of the largest credit unions in Maryland, with over 34,000 members. As a not-for-profit financial institution, we provide our members lower lending rates, higher dividends and more services with fewer or lower fees. Our members enjoy membership benefits for life. Welcome to banking the credit union way. If you live, work, worship, or go to school in the City of Baltimore; are employed by or retired from SSA or CMS; or are in the immediate family of an existing member; you are eligible to join the credit union.